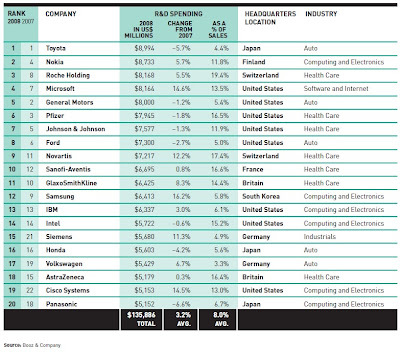 In the face of a severe global recession, the world’s 1,000 largest publicly traded corporate research and development spenders increased R&D budgets in 2008, affirming the critical importance of innovation to their corporate strategies, according to Booz & Company’s Global Innovation 1000, the global management consulting firm’s fifth annual analysis of global innovation spending. R&D spending at these firms rose 5.7% in 2008, a slower rate of growth than the prior year’s 10% increase, but in line with the group’s 6.5% increase in worldwide sales. More than two-thirds of the companies included in this year’s Global Innovation 1000 maintained or increased R&D spending in 2008, even though a third of the companies reported a financial loss for the year. Judging from the data in this year’s study, the results of the senior management survey, and conversations with executives, the recession’s effect on innovation activity has not been as severe as some observers of the business scene might have anticipated. Innovation has become central to every company’s efforts to compete, and the degree of competition has been in no sense reduced by the downturn; if anything, it has been heightened. Long product development cycles have forced companies to maintain their R&D spending even when revenues decline. And most companies are fully aware of the need to be in position to profit from the coming upturn. Virtually all the companies we contacted noted that they have learned to streamline R&D processes, to make sure their product development filters more effectively reflect economic reality, to make smart bets on advantaged technologies, and to kill weak projects more quickly. All these changes should help them get more from their R&D investments over time. As we head into a better business environment, smart companies will see this recession as a learning experience. Every company should take the time to assess the strengths and weaknesses of its innovation systems and processes. The downturn no doubt revealed some major gaps in innovation capabilities. Fix them now. Doing so right away will pay dividends in terms of speed-to-market, quality of execution, and capacity - both in the coming upturn and well into the future. Corporations can increase their R&D budgets at the same time that they're being taxed to death and over-regulated. I wish that the Democrats would realize that innovation is in spite of government, not because of it. Well, penalizing US citizens is not the thing that should be rewarded. This seems to indicate that is the case, if indirectly. One of the issues that needs to be addressed is what I like to call the popular science-business week gap. There are lots of ideas posted on popular science and have been for the long history of the magazine. However few get to implementation, due to failure to make a business case. It takes someone who is willing to play bet the company to make a major innovation (Tom Watson JR at IBM on the system 360 comes to mind). Note however that IBM was at the time essentially his company, current hired managements aren't in a position to play the game. This is what venture capitalists do, and the wise company would encourage internal VC efforts. With HSAs, Mammogram Frequency Is A Non-Issue?